I hope you’ve had the most amazing week! You all know that I’ve been loving all tweed everything lately (as seen here and here). 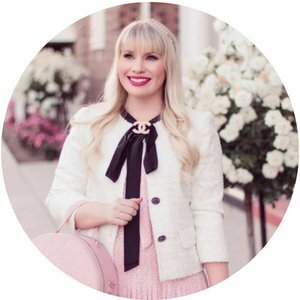 I think it’s just the perfect fall fabric and it looks so luxe! 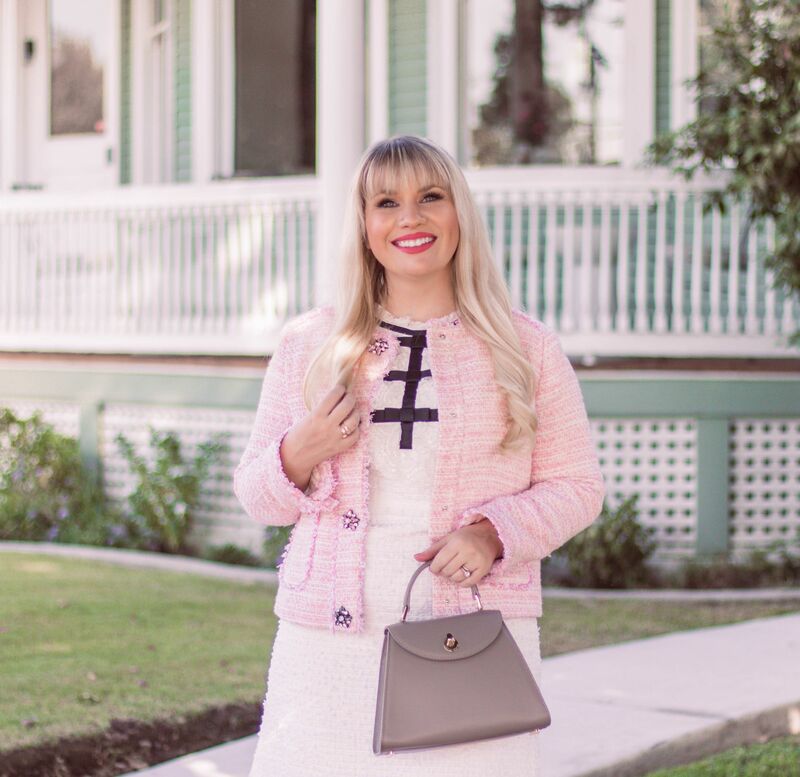 Read on to see how I styled this feminine tweed outfit! I thought this dress was the cutest thing ever! I just love cream with black and the bow details are adorable. It’s sleeveless and although, I don’t usually wear sleeveless dresses by themselves, I do think it looks great with an outer layer. 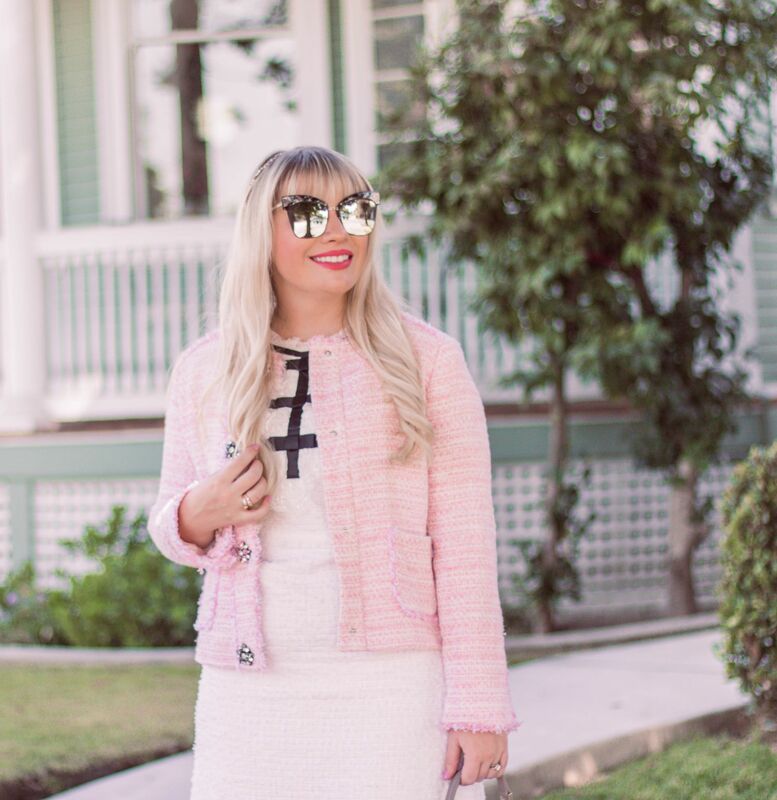 You might recognize this pink jacket from NYFW. It seriously goes with everything and I just love it! I know I will be getting so much wear from it as we transition into the colder months. I paired it with these amazing black heels and kept my jewelry minimal by only adding a couple of dainty rings and a sparkly headband. 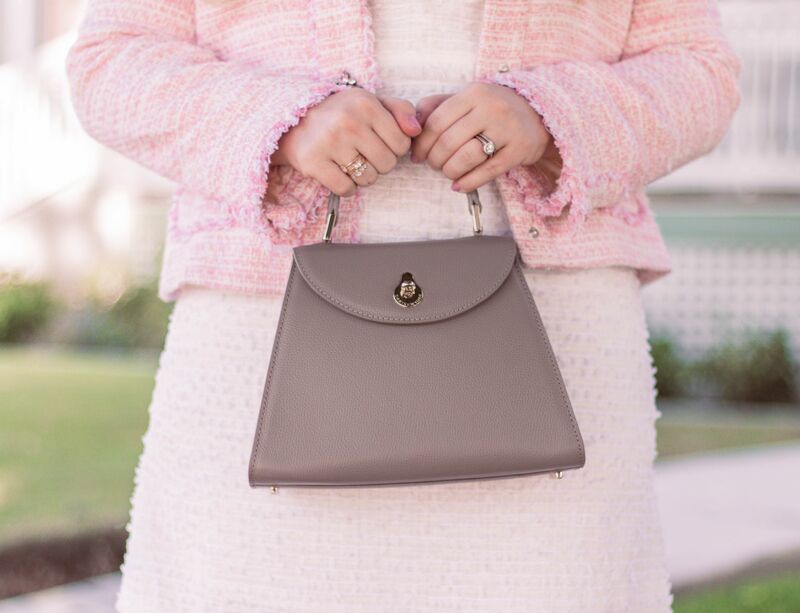 I also added this incredible taupe handbag! 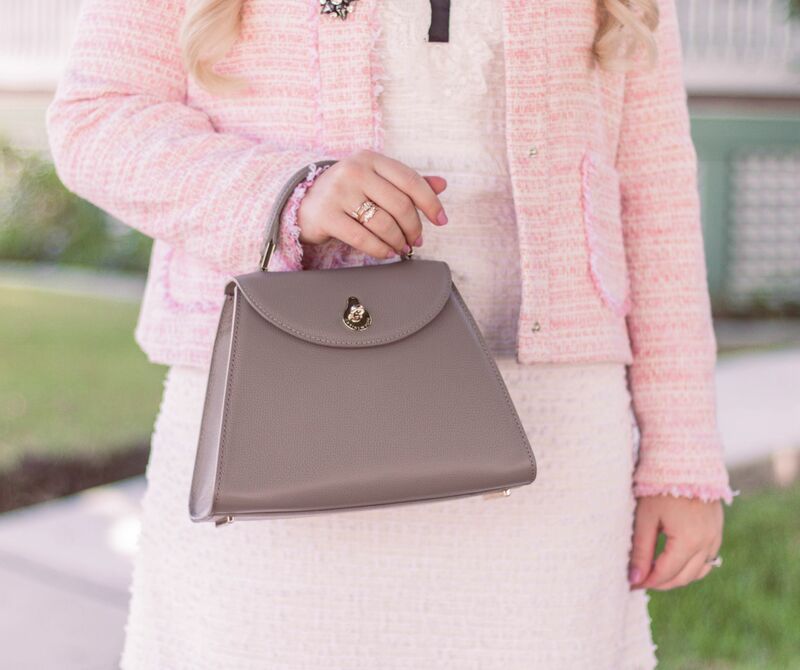 I have a thing for structured handbags…I just think they are so polished yet feminine and this one in particular has a really unique shape that I love (it also comes in black and the most amazing wine color)! 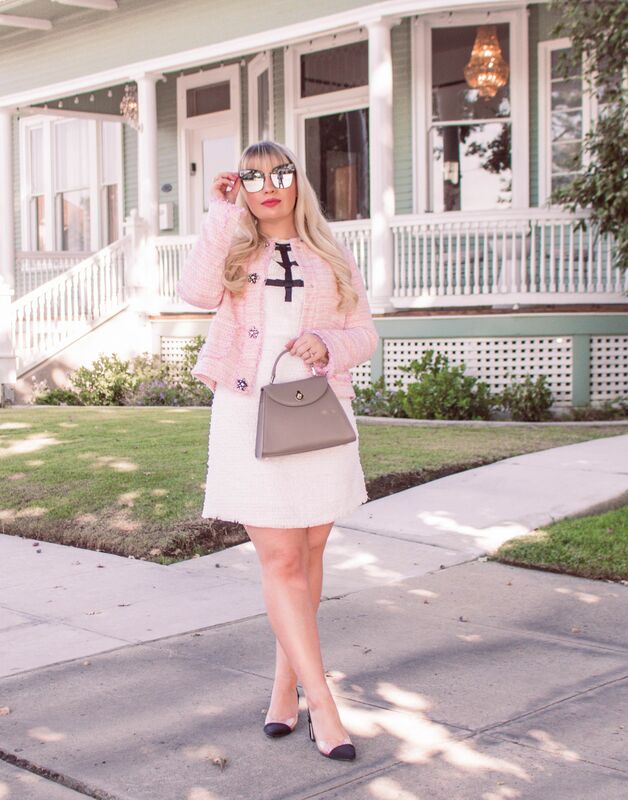 I thought the sunglasses were a fun finishing touch and of course, the cat eye shape is to die for! Today, I’m finishing up my closet clean out and will start listing things on Poshmark (find me under @lizzieinlace). 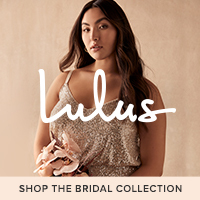 I have some really great finds so check it out! Also, we are packing up everything this weekend in preparation for our annual Yosemite trip next week! I always forget how lucky we are to live so close to such a beautiful place (people literally fly in from all over the world to see it)! I’m so excited to get out and explore while making new memories…and of course, I’m excited to take a small social media break since I won’t have reception haha! I’ll be sure to share on stories when I get back though 😉 Anyway, see you all back here on Monday! Do you have any fun weekend plans? 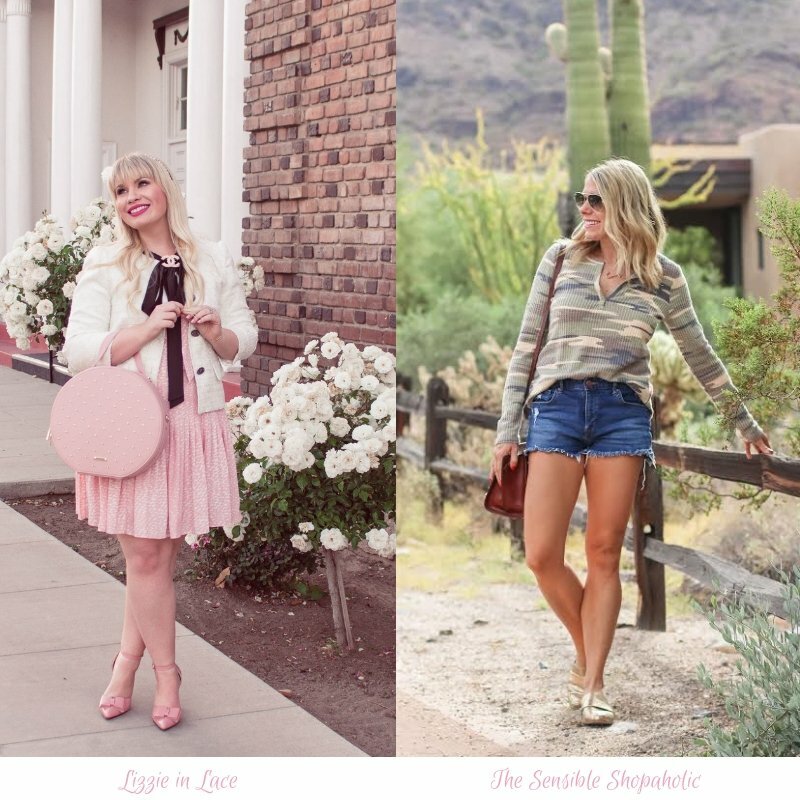 Welcome to the Friday Favorites link up with your co-hosts Liz from Lizzie in Lace and Jenny from The Sensible Shopaholic!